I wish this was all I was packing. The first practice pack was wildly unsuccessful … trying to be creative about re-arranging things. Fun times at the Holland household this evening! The bottom line is that it will be packed by Sunday afternoon at 4pm, so no stress, right? RIGHT?! How many pairs of socks is too many? Do I really need that other pair of sneakers? Should I bring business attire? Can I buy my contact solution in Spain? Should I pare down the school supplies? Am I seriously going to make this happens in two bags? How many pashminas is too many? Where the hell did all of these clothes come from and how much would it cost to hire someone to do this for me? It’s a fact — I’ve entered the Do Not Wear it if You’re Going to Pack it stage. There will be no more laundry unless I have a total crisis and reevaluate my entire wardrobe. Once all is said and done I think it would be fair to say that I am leaving at least 80% of my wardrobe at home. That’s a lot. It also makes me think I have too many things to begin with — something that has plagued me in recent years as I tried to go green (with limited success) and take control of my material possessions. I know I can buy virtually anything I need when I arrive at my destination, but there is a level of comfort to be considered here. I’m not going to want to go out and buy new clothes the minute I get there. I want my own jeans. I want to settle in, head to a local cafe, hang out with my week-long roommate over a cup of coffee (or a glass of sangria) and chill out. There is to be no panicking, and no shopping. I’ll shop when I get the apartment. Oh but it won’t be the one the lady at my school is renting ……. because I just found out she rented it to someone else. Mierda! When preparing to travel, lay out all your clothes and all your money. So I did it. I started packing. I made a rapid fire list this morning and now my bedroom appears to have been hit by a hurricane. As promised, here’s the first take of what’s going in. 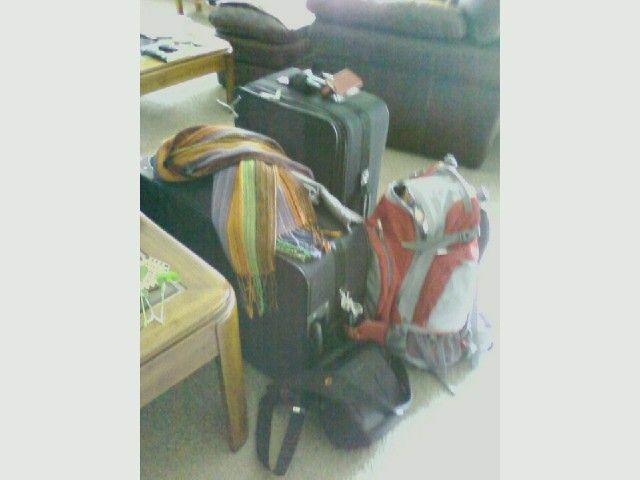 Remember I’m planning for TWO bags: 1 medium suitcase and 1 large backpack. I’m flying with United so that means one 50lb bag (max 62″) flies free. Shoes: black pumps, brown sneakers, flip flops, Merrills? Asics? Boots? Piece of cake, right? Excessive paring down and some decision making tomorrow. Four days to go! 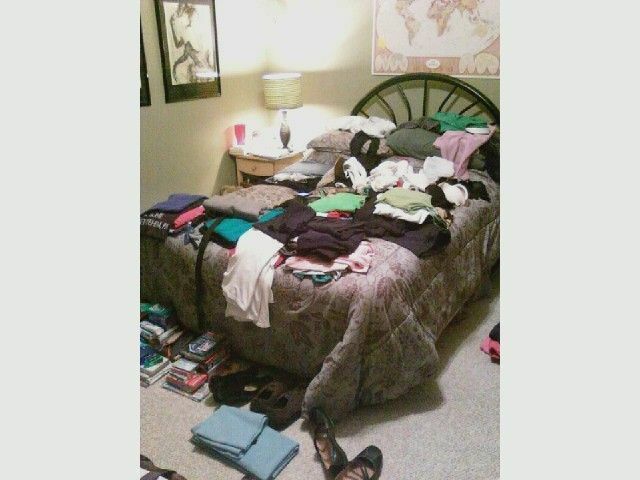 The Universe is conspiring to force me to pack. I don’t want to pack! The mere thought of it kind of exhausts me. Although this weekend we are headed to New Hampshire so I have to semi-pack. This just means more laundry next week! @matadornetwork featured an article on their weekly newsletter called: Essential Packing List for Multi-Day Treks… which is probably stretching it a bit for me. For you backpackers, its a sweet read. For me, I know I’m not going to pack a stove, so I’m out. After I realized it was very camping-centric, I headed toward the “Packing Tips” page. There is so much info on this page, culled from blogs and firsthand accounts, it is a bit overwhelming. “stuff-sacks” – although I have never heard them referred to that way – are awesome. I first came across these when I packed for Spain the first time around and needed to take some sweaters. Pop them into one of these oversized bags (aka SpaceSaver bags) and you can save yourself some room and compartmentalize your stuff. This is particularly helpful when you are asked to unpack your suitcase for security (see: Tel Aviv Ben Gurion airport). mix & match. Don’t pack specific outfits. I picked this up from the packing gurus at OneBag – you can do a lot with repeating attire. Throw on a belt or a scarf and change it up a bit. Settle on a pair of comfortable shoes, bring some flip flops for beach or shower and saddle up. I realize this is terrifying for you fashionistas. Check out this article for more advice on packing light and staying fashionable. quick dry is key. This tidbit saved my life in Costa Rica two summers ago. If you can avoid it – don’t bring jeans! Denim is the slowest drying fabric ever, and you’re only going to be pissed off when you try to pull on damp jeans after they’ve been hanging out for 12 hours. I love UnderArmour for this, as well as any of the fabrics pushed by athletic companies like Adidas that support quick-dry and sweat-wicking fabrics. stash a bag. I haven’t attempted this yet, but I can definitely see how it would come in handy. Several sites have advocated for the addition of an extra duffel bag that you can fill with souvenirs for the trip home. carry it on. Whenever possible, I will avoid checking luggage at all costs. Even if I’m on a direct flight, I board a plane knowing that I may never see my suitcase again, so I pack accordingly. As noted in this homage to traveling light (which includes a plug for Rick Steves), you have less to worry about losing. must-haves. The Nikon (never leave home without it). A journal (this is both cathartic and useful while traveling). Here’s my theory: Pack for ten days, add some weather-appropriate attire. Wash, Rinse, Repeat. High maintenance, right? Not. I’m going to a town where there are (1) clothing stores, (2) shoe stores, and (3) washing machines. I’m a habitual layer-er already, so I’ll pack a bunch of different layers, and hope for the best. I promise post-New Hampshire that I will post a list of what is actually going with me. Ten days to go, folks!